Robinhood Financials is a stock brokerage firm with a twist – you can trade stocks and ETFs on your mobile phone (Apple and Android) without paying a dime in commissions costs. Since its founding in 2013, this free stock trading business model has become so popular among investors that Robinhood joined the start-up “unicorn” club with a valuation north of $1 billion. Robinhood lives up to its marketing pitch of providing free stock trading. So how does it make money? The answer is Robinhood Gold, a service that lets users trade on margin, which increases client stock buying power by up to 100% – though risk increases commensurately too. Robinhood Gold is an optional service, so clients can truly enjoy free stock trading if they wish via the Robinhood app. Another way Robinhood makes money is from interest earned on cash and securities held in Robinhood accounts. It is worth spotlighting that Robinhood is only available on mobile at this time. The functionality and experience is good for fee-sensitive stock and ETF traders. Active traders who are looking for the bells and whistles of stock screeners, technical analysis tools, and stock back-testing simulators may prefer web-based or desktop platforms, such as Tradestation or thinkorswim. The Robinhood trading app has so far been more successful than some other companies, such as Zecco, who unsuccessfully tried to launch free stock trading brokerage services. However, they do have competition in the commission-free stock trading services space, albeit from a robo-advisor. WiseBanyan is a robo-advisor that caters to an audience of investors who are more hands-off. Like Robinhood, WiseBanyan has a free basic service level and charges for optional services, such as tax-loss harvesting. >> Prefer to be a hands-off investor? The Robinhood app is designed for the casual investor who wants to link into their investment portfolio and trade stocks or ETFs quickly and easily on-the-go. Customers who are looking to generate higher returns, and comfortable with the commensurate risks can trade on margin for a fixed monthly fee. The target customer of Robinhood is mobile-savvy and fee-sensitive. Robinhood is only available on mobile devices currently, so desktop fans will have to wait to trade stocks online via PC or Mac. The interface is highly navigable and simple. It is easy to login with fingerprint recognition on smartphones. And it’s easy to transfer funds. Fee-sensitive customers will love that commissions for its basic service are truly zero. Account minimums are also set at $0, making Robinhood highly accessible to traders of virtually every wealth level. A minimum deposit is obviously still needed to purchase shares and cover the minimal SEC and FINRA fees that may apply. Robinhood Gold, the paid service, targets active traders by providing after-hours trading capability. For 30 minutes prior to the market open and 2 hours after it closes, Robinhood app customers can trade the stock market. The idea is to allow active traders buy and sell stocks during the time frame when companies report earnings pre-market open and after the market closes. A note of caution is liquidity tends to be lighter during these after-hours trading periods which results in wider bid-ask spreads. Another feature accessible to Robinhood Gold customers is the ability to tap into a credit line. For the privilege, a monthly fee is charged and a minimum $2,000 account balance must be maintained. If for any reason, you wish to stop paying the monthly fee, you can cancel easily. Robinhood wins fans with its $0 commissions and $0 account balance minimum, as well as its easy-to-use mobile interface and margin accessibility. It is limited in the range of stock tools, stock screeners, stock research and stock scanners provided. Where Robinhood earns brownie points is its $0 commissions and $0 account minimum. It only takes a few minutes to get started after you answer a few quick questions and provide your social security number. Users of other financial services who have previously had to verify account ownership by confirming micro-deposits will be relieved that Robinhood uses instant bank verification which simplifies the account setup process. Another user friction experience Robinhood overcomes is minimizing the time delay from funding to trading. Robinhood makes up to $2,000 instantly available when you make a funds transfer – instead of having to wait a few days as is the case with most brokerage platforms. Beginner investors won’t be overwhelmed by an intimidating user interface or complex order types. The interface is simple and highly navigable, making it easy and intuitive to buy and sell stocks and exchange-traded funds. Robinhood supports basic order types: market orders, limit order, stop limit orders and stop orders. For traders with higher risk tolerances who wish to increase their buying power, Robinhood offers margin trading – the margin acts as a credit line to let users borrow money to invest. It comes at a cost of a monthly fee that increases when more margin is used. Keep in mind that while portfolio returns may be amplified when trading on margin, so too are losses magnified. It is possible to lose more than you have when trading on margin so the enticement of increasing your buying power should be evaluated with due caution. Getting started is easy at Robinhood, except for one critical aspect: transferring funds from another brokerage account. Robinhood does not support brokerage transfers in-kind, so if you want to contribute to your Robinhood account, funding will need to be in cash – and hence any existing holdings at another brokerage firm will need to be sold which can lead to tax consequences. Stock and ETF investors will find an abundance of securities available to trade but options traders, futures and forex traders may be better served elsewhere, such as at OptionsHouse and TradeStation. Higher net worth clients with Trusts, retirement accounts, such as an IRA or 401(k), or 529 Plans will not find those account types supported at Robinhood, which caters to taxable accounts only. The bottom line is Robinhood provides a simple trading app. Trading is easy but if you are looking for equities research, interactive stock charts, stock trading simulators, or stock back-testing, it would be best to look at alternatives, such as thinkorswim. The Robinhood app has no account balance minimum, free stock trading because it doesn’t charge a dime in commissions, caters to traders who want access to margin to amplify returns, and is easy to setup and navigate. Where Robinhood falls short is it offers only taxable accounts, does not permit in-kind transfers from other brokerage accounts, and has limited stock tools and stock research. ✅ No Commissions: By far, the most attractive feature of the Robinhood app is its no-commissions stock and ETF trading. Simply put, Robinhood can’t be beaten in this respect. But beginner traders should note that SEC and FINRA fees still apply. ❌ Limited Account Types: Only taxable accounts are supported so retirement investors looking to use Robinhood for IRA or 401(k) accounts will be restricted. ✅ Low Account Minimum: No account minimum is stipulated for basic service but margin accounts will require a $2,000 minimum as required by regulations. ❌ In-Kind Transfers: Clients wishing to avoid tax consequences of selling stock portfolio holdings elsewhere are not permitted to make in-kind transfers, necessitating cash contributions to fund accounts. ✅ Easy Setup: Fast setup, instant bank verification, instant access to up to $2,000 in funds, and easy cash transfers makes it easy to get started setting up a Robinhood account. ❌ Tools and Research: The Robinhood app is a no-frills brokerage service that caters to stock and ETF trading but does not provide the research or tools that active traders may want to support trading decision-making. ✅ Margin Trading: Traders with a higher risk tolerance can take advantage of margin trading for a tiered monthly fee that increases as more money is deposited. ✅ Mobile Friendly: Robinhood is only available via mobile devices, and caters to Apple and Android. Robinhood supports only stock and ETF trading so mutual fund investors, bond investors, futures traders, forex traders and options traders should look to other services. Robinhood has no commissions costs, inactivity fees or annual fees but it will cost $75 to transfer funds out of your Robinhood account via ACAT transfer. For casual, fee-sensitive traders on-the-go, the Robinhood app is an excellent way to trade stocks and ETFs without paying any commissions costs. It’s easy to get started, verify your bank details, transfer cash and start trading. If you don’t care about the bells and whistles of stock screener tools, stock research or advanced charting then Robinhood will be a good fit. 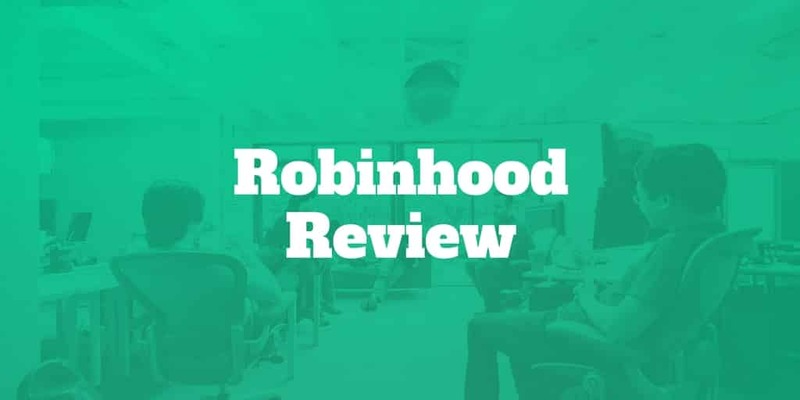 Higher net worth clients who need more choice than the taxable account type Robinhood provides will need to consider other alternatives, such as thinkorswim. Investors who want similar no-commissions costs benefits but a more hands-off experience should consider WiseBanyan, a robo-advisor that has a free basic service.